The primary purpose of the Department of Indian Ministry is to be at-one-with the Indian people within the diocese, a listening presence in their midst and a promoter of Catholic Indian celebrations. 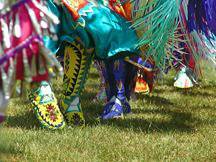 Established in 1993 and continuing through a grant from the Bureau of Catholic Indian Missions, the department sponsors retreats, days of recollections, special Kateri Tekakwitha celebrations and an annual Indian Harvest Mass. The director attends/leads the Kateri Circle Meetings and the National Tekakwitha Conference at which she has been a presenter. We are very proud of our youth Kateri Circle on the Grand Portage Reservation, though inactive at the present, the first in the state. The director represents the diocese at various church, civic and tribal functions and serves as the voice that brings Indian concerns to the attention of the Bishop, the diocesan officers, and other directors of diocesan offices. . The Anishinabe, also known as Ojibwe and Chippewa (each name having variations in spelling), live within the Diocese of Duluth. These, the first people in our area, generously shared the gifts of Mother Earth with the early trappers and fur traders who came to the Arrowhead region of Northeastern Minnesota. Wild rice is one of these gifts - a special gift of the waters of which the Spirit had directed the Ojibwe to search in their migration West. In general, the director is present to the Anishinabe. This "presence" takes many forms and many times it is a silent presence of just being one with them. Rejoice with us as we continue to celebrate the Canonization of St. Kateri Tekakwitha - an event that took some of us to Rome for this festive occasion on October 21, 2012. We were joined by 800, 000 other Pilgrims in Rome for the canonization of our seven new saints. To Bishop Paul Sirba, the Bureau of Catholic Indian Missions Office, and the many contributions from members of the Diocese of Duluth and elsewhere we thank you for this wonderful gift and assure you that you were present in our prayers as we made our pilgrimage in Italy. You were there as we received the special blessings from the Holy Father and at each Mass. May St. Kateri Tekakwitha continue to walk with us as we strive to imitate her in reaching out to the young, our elders, the sick, and to hold close to our hearts her devotions to Jesus on the cross and to His Mother. A Kateri Circle is a group of Women and Men and/or Youth of all cultures within a parish/mission who want to belong to a prayer circle/group for the purpose of learning and promoting the saintly life of Kateri Tekakwitha, patroness of the Tekakwitha Conference. At each meeting we say a prayer in honor of St. Kateri and ask our Creating God to be with us as we strive to be more like Jesus and our elder sister, St. Kateri Tekakwitha. As her name tells us she is "one that makes order" - may she help us make order in our lives that we may live in harmony and union with all of creation. Join us for prayers before St. Kateri's statue after Mass each third Sunday even if you can not stay for our meeting. Everyone is welcome. Meets: 6:00 PM on the second Monday of each month. We also have a book club you may wish to join. During this month of December we remember the presence of our Creator in a special way. Join us in mending the Sacred Hoop where all creation is one with the Creator...... sisters and brothers are we. 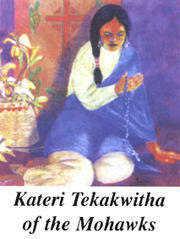 The day when St. Kateri Tekakwitha died. Let us join in thanking our Creating God, the Great Mystery, for giving us such a worthy role model. St. Kateri, pray for us. Consider visiting one of the many places in our diocese where we have a statue, a shrine, a relic, or a stained glass window of St. Kateri. Join us as we show our love and honor to St. Kateri in our prayers, works and sufferings on her Feast Day. May she be a source of inspiration in our daily lives as we walk with her to greater holiness, love of Jesus and his cross, and devotion to Mary, his Mother and ours. **Watch for important events in your parish bulletins and in our Diocesan Newspaper:The Northern Cross. ALL ARE WELCOME TO GIVE THANKS WITH US FOR OUR HARVEST OF WILD RICE AND BERRIES, VENISON, OUR LIVES, OUR VETERANS, OUR DECEASED, SAINT KATERI TEKAKWITHA, THE FLORIDIAN MARTYRS, NICHOLAS BLACK ELK, ALL THOSE HOLY ONES WHO HAVE GONE BEFORE US AND THE COUNTLESS OTHER BLESSINGS WE RECEIVE DAILY FROM OUR CREATOR. the Missionary and Native American Martyrs (1549-1706) of La Florida (The Floridian Martyrs). On July 4th of 1704, the Last Battle in Apalachee for the Catholic missions took place.
" I find tragic that 21st century Christians in Florida are unaware of the lives and heroism of the first Christians in Florida. How can we treasure their legacy if in fact we do not know their story?" - Bishop Felipe J. Estevez, Bishop of St. Augustine, FL. And for the canonization of Nicholas Black Elk, Lakota Holy Man (1865-1950) who, as a lay catechist on the Pine Ridge Reservation in South Dakota, is credited with leading over 400 Native People to baptism. Fr. Michael F. Steltenkamp entitles his 2009 book on Black Elk as - Nicholas Black Elk - Medicine Man, Missionary, Mystic. Two of us from our diocese were able to join the Diocese of Rapid City, SD at Holy Rosary Mission on the Pine Ridge Reservation on October 21, 2017 for the opening of the Cause of Canonization of this holy elder. May we, like Nicholas, lead others in walking the Sacred Red Road to Jesus. Jesus Christ among Native people. glory and honor of God the Father. remembering always that we are your children, sisters and brothers, one family in you. Holy Man Nicholas Black Elk, intercede for us." Theme: "From all directions, St. Kateri leads us to holiness"
Contact the National Office for more information. See below for address and phone number. "Our first task in approaching another people, another culture, another religion is to take off our shoes - for the place we are approaching is holy. Else we may find ourselves treading on another's dream. More serious still, we may forget that God was there before our arrival." "Every culture contains the seed of the Gospel. we miss the chance to grow spiritually. and see what life we can make for our children." "MIIGWETCH" (Thank You) FOR VISITING OUR PAGE.